Would you like to experience a transformation in a short time? 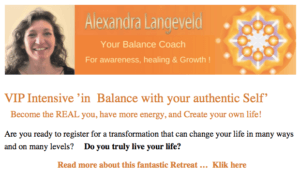 Do you want to break your vicious circle and get rid of your pain? Especially for you I have a number of programs where we go into depth and tackle the problems from the roots. In my video I tell more about it. You have long-term results! Click on the pictures for more information! During this 4 day retreat we gonna make an inner journey what can change your life on different levels. 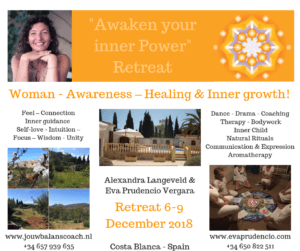 “Awaken your Inner Power”, Coming home by your true self. During this VIP Intensive day(s) we work on problems what block you. The intestines, that’s where our health begins ! If you want more information, please contact us ! 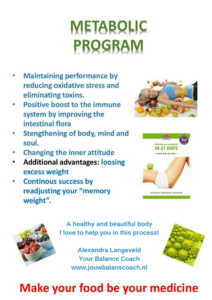 A healthy and beautiful body, more energy, no jo-jo effect! During this program you will lose weight in a responsible way, your metabolism will be balanced and you will gain insight into your eating patterns and the underlying problems. Heb je vragen of wil je meer informatie neem dan contact met me op.